HAVE1.COM offers a full line of professional and affordable printing solutions to help your business grow. We offer a complete service from artwork to finished product, whether it be printed lithographically, digitally or photocopied. Customer satisfaction is our #1 concern, and we will do what it takes to make you happy. We choose the best method of production based on the application and the quantity. This flexibility allows us to provide the best possible pricing and quality to you — no matter what task you send to us. We offer full finishing services from binding, lamination, stitching, folding etc. If you already have your own project design, just upload your file and we will handle the rest. If you need design help, we can help you with that as well. Let us help you develop or update your company’s corporate identity and marketing material. From design to finished product – we are your one-stop source. We provide a full range of graphic design, illustrations and desktop publishing services. Talk to one of our experienced and talented designers to make your company’s corporate image stand out. Looking at updating your company’s image? We incorporate your ideas and give you personalized service to produce superior results. Let one of our knowledgeable designers help develop or update your company’s corporate identity. Your logo will be designed for use on all your company’s stationery, business forms, marketing material, signage, vehicle graphics, web site, etc. – always keeping your image looking consistent and professional. Have a look at some of our logo packages – affordable, professional and easy to order. Business cards, the one thing every business needs! Your business card is often the first promotional material a person receives from your company. It’s also the item most people keep to remember you by. Folded business cards available upon request. Letterhead is a perfect tool for branding official documents. It allows you to show who you are as a business with every message you send. Let your letterhead create a coordinated, professional look today. Available on 60lb text weight. Custom branded envelopes printed directly from your supplied digital file or professionally designed by one of our graphic designers. Branded envelopes are an excellent way to professionally send invoices or important information through the mail. Custom note pads printed directly from your supplied digital file, or professionally designed by one of our graphic designers. Our note pads are printed on standard 5.5″ x 4.25″ white paper with 20 sheets per pad and can be printed with black or colour designs. A modern upgrade from the classic carbon paper, NCR forms allow you to create multiple copies of a handwritten, or impact-printed, original document. Commonly printed in 2-part, 3-part, and 4-part forms, the different coloured paper is used. Full colour door hangers / danglers printed directly from your supplied digital file, or professionally designed by one of our graphic designers. Door Hangers are an excellent way to catch peoples attention while being convenient to distribute. Rack cards are smaller than brochures and flyers yet they have their advantages over those types of print media. Rack cards are designed for quick consumption, typically conveying all of their information in a glance whereas posters and flyers must be read. Postcards are miniature billboards in the mailbox, and are great advertising for small businesses. The fact is that postcard marketing is a very effective marketing tool to reach your target prospect. Use eye-stopping graphics and benefit-oriented headlines and text. Brochures are offered in a variety of standard or custom sizes, and unlike a flyer which is usually left flat, a brochure contains folds that create multiple panels or pages of information. The pages of a brochure are generally of a heavier paper weight. Flyers are usually a single, unfolded printed sheet that is used to draw attention to an event, service, product or idea. A flyer typically contains a very simple message that can be conveyed quickly. Perfect to announce a one-time event like a grand opening or promotion. Full colour presentation / pocket folder will increase your professional image. Perfect for transporting important paperwork to the job site, or to handout with information pages inside. Includes slits in pockets to place your business card. Professional, full colour booklets, or catalogues, will effectively sell your products. The most efficient page counts are typically, 8 pages, 16 pages, or 32 pages, and are always kept to a multiple of 4. Custom printed greeting cards, thank-you cards, invitations, Christmas cards and many other types of cards. Printed and packaged open face and scored for easy folding. Blank white envelopes available. 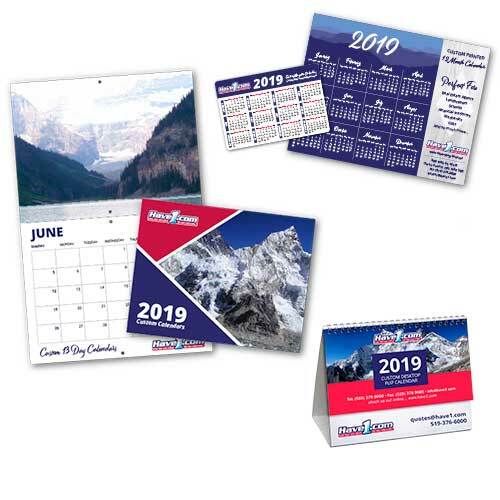 Our calendars are designed to be practical, easy, and affordable. Month to month they will reinforce your brand and image in a client’s mind. Choose a pre-made template or create a something completely custom. Have a look at some of the print projects we have completed for clients. Showing examples of Rack Cards, Business Cards, Stationery, and much more!